Where do I use my Discount Supplements voucher code? Discover many different types of protein powders, protein drinks, proteins snacks and meals, all in one products, meal replacements, weight gainers, amino acids, bodybuilding supplements, creatine, energy and endurance products, intra workouts, post-workout recovery products, pre-workout, ready-to-drinks, diet protein, weight management, CLA, green tea, L-carnitine and multibuys. Discount Supplements also provide a wide selection of health accessories including shaker and water bottles, sports clothing, training accessories and yoga and pilates equipment. As well as discounted health supplements, you can also find a huge array of affordable wellbeing products including antioxidants, digestive health, fish oils, omegas, health foods, immune support, joint support, men’s health, multi-vitamins, minerals, personal care, superfoods and women’s health. Discover great deals and a huge selection of affordable products in the special offers section. Search for your discounted supplements by serving, product size, type, protein, day, sport, unit container, unit measurement, unit quantity, unit size, flavour and colour. Refine your search to find supplements with the specific amount of protein, carbohydrates and fat you require and be presented with a huge selection of affordable products that suit your fitness requirements perfectly. If you’re looking for advice and additional information about all the products and services supplied at Discount Supplements then take a look at the blog. Here you can browse through the latest and most popular articles on all things vitamins and supplements. Read blog posts on tumeric, training principles, product reviews, the importance of hydration for endurance, peri-workouts, overnight oats and much more. Browse through tons of categories in the blog section and discover even more, including recipes, guest blogs, videos, news, daily tips and ambassadors as well as articles dating back years in the archive. 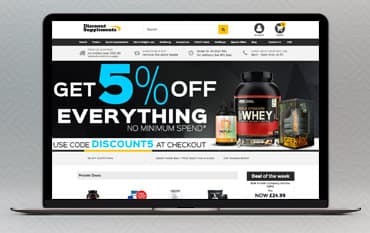 Discount Supplements is the UK’s largest online sports supplements store stocking a huge supply of protein, diet and weight loss products as well as wellbeing supplements, multibuys and accessories, all for affordable prices from top brands like Adapt Nutrition, Grenade, PHD Nutrition and many more. Shop online for all these products with a Discount Supplements discount code from us and enjoy great savings on your order. You can also enjoy great discounts in the special offers section as well as helpful buyers guides and a handy blog section.